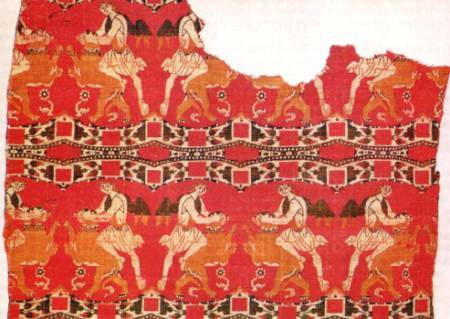 The cathedral treasures of Chur contain a silk fabric made in Syria around 800, which shows fighting pairs, grouped in mirror symmetry around a lion rampant. This scene is traditionally interpreted as an allegory of the truimph of good over evil or as an illustration of David or Samson battling the lion. However, such fabrics were used only secondarily in a religious context, which suggests an interpretation that is independent of Judaic-Christian thought. Conquering the lion, a Byzantine mataphor adopted from ancient oriental tradition, stands for the King's or Emperor's ability to protect his subjects from danger, the source of which - in a pastoral society - came primarily from beasts of prey. The ruler becomes the good shepherd. Surprisingly, different interpretations therefore arrive at the same conclusion, inasmuch as both David and Samson embody the stout shepherd who protects his herd from evil in the form of menacing wild animals.